I've seen so many people do posts and videos on this that I thought it was about time I did one! 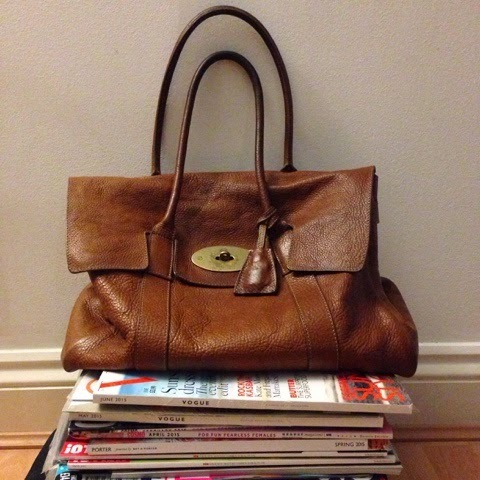 Starting off by saying that my current handbag is the Bayswater by Mulberry. I do love a good quality British handbag and have quite a few that I use on rotation. Mulberry is probably my most favourite brand as they do such classic and classy handbags that will last forever which is good considering the price tag..
My purse is this beautiful green suede one by Stella McCartney which my mum gifted to me last year. I have got the Mulberry one to match my bag but I love this green one so much I can't give it up just yet and to be honest I'm not much of a 'matchy' person. I always have a book in my bag as I get the train a lot and it passes the time. I've always been a real book worm since I was little and I'm currently reading Gone Girl. I'm near the end and it's getting so good I can't wait to see the film! Always important to carry in your bag for tidying your hair up throughout the day. I bought a Tangle Teezer as they're small and easy to carry, they also work really good on thick hair and extensions. Mascara is probably my ride or die make-up item. The 'if you could only have one makeup item on a desert island' product. So I always carry some for touch ups and the one I have in my bag at the moment is L'Oreal Miss Manga. 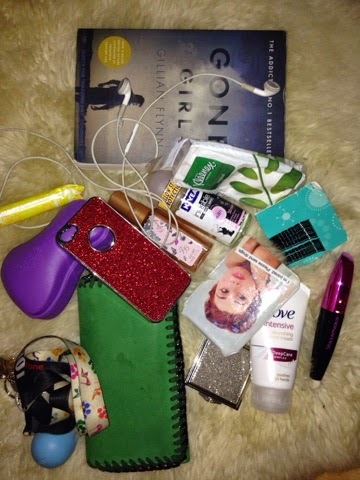 I also carry hair grips, tissues, deodorant, body spray, lip balm, hand cream, tampons and a mirror (click for links). All the essentials in my eyes! Can't go ANYWHERE without a pair of earphones or headphones. Literally obsessed with listening to music and there's nothing I like more than shutting the world out and getting lost in song. I actually won an award at school for being 'surgically attached to my iPod'! If I'm not travelling by car, which is most days, then I only take my house keys out with me and I have them on this really cool chain I got one year from London Fashion Week. I also have a cute Tiffany keyring my friends bought me back when I was 16! Last but not least my most treasured possession! Seriously, where would we be without mobiles these days. I currently have the iPhone 5 which is due for an upgrade next month. I'm not sure what to get yet, any suggestions? ?